According to Wikipedia online, Columbia is a planned community with a small-town feel that includes 10 self-contained villages in Howard County which is nestled between Baltimore and Washington DC. Columbia is a suburb of Baltimore in the Piedmont region of Maryland with the idea that a city could enhance a resident’s life. Columbia has plenty of large private homes on large lots with big box retail stores for convenient shopping. The plan for Columbia was to have a community without racial, religious or income segregation. The villages will have jobs, schools, shops, medical services and various types of housing. The first village in Columbia was called Wilde Lake with the first high school being Wild Lake High School which opened in the early 70s. The center of Columbia includes the Mall in Columbia which has five department stores, over 200 specialty shops, a theatre, restaurants and more and the man-made Lake Kittamaqundi (meeting place) which is a 27-acre reservoir popular during the summer for many festivals and Fourth of July celebrations. Besides ‘the Mall’, there are other areas to shop in Columbia such as Snowden Square, Columbia Crossing 1 and 2, Dobbin Center, Gateway Overlook and so on. Shopping isn’t the only recreational activity in Columbia. There are many facilities boasting fun-filled activities for the entire family like 23 outdoor swimming pools, six indoor pools, two water slides, ice and roller skating rink, an equestrian center, a sports park with miniature golf, batting cages, picnic locations, athletic clubs and more fun to have in Columbia, Maryland. 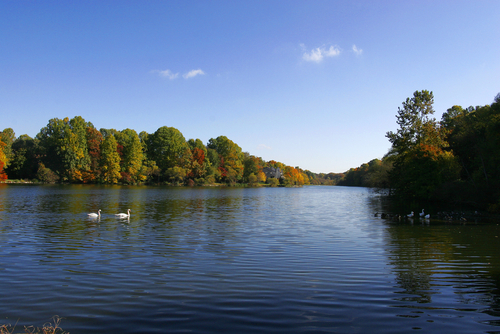 There are also a few lakes where families can enjoy fishing, sailing, and boating. There are no nightclubs in Columbia but there are bars and other entertainment venues like the Merriweather Post Pavilion where many concerts are held. There are many neighborhoods in these 10 villages including Bryant Woods in Wilde Lake, Longfellow in Harper’s Choice, Thunder Hill in Oakland Mills, Phelps Luck in Long Reach and so many more. Columbia, Maryland has streets named after famous works of art and literature such as Running Brook from the poetry of Robert Frost and Clemens Crossing from the works of Mark Twain. If Columbia, Maryland seems right for you and your family, let the All My Sons of Maryland movers help you move there. Your residential moving day will be hassle-free thanks to the expertise of the Maryland local movers. We’re backed by four generations of professional movers and are part of an enormous, reputable network of All My Sons moving network. We also operate a charity initiative and give back to the communities we serve throughout the US. For a headstart on your move, go online to the All My Sons of Maryland movers website for a free moving quote and tips on how to properly pack your personal belongings.